Bam volcano is one of the most active volcanoes in Papua New Guinea. A mostly submerged stratovolcano forms the small 2.4 km x 1.6 km oval shaped Bam Island. 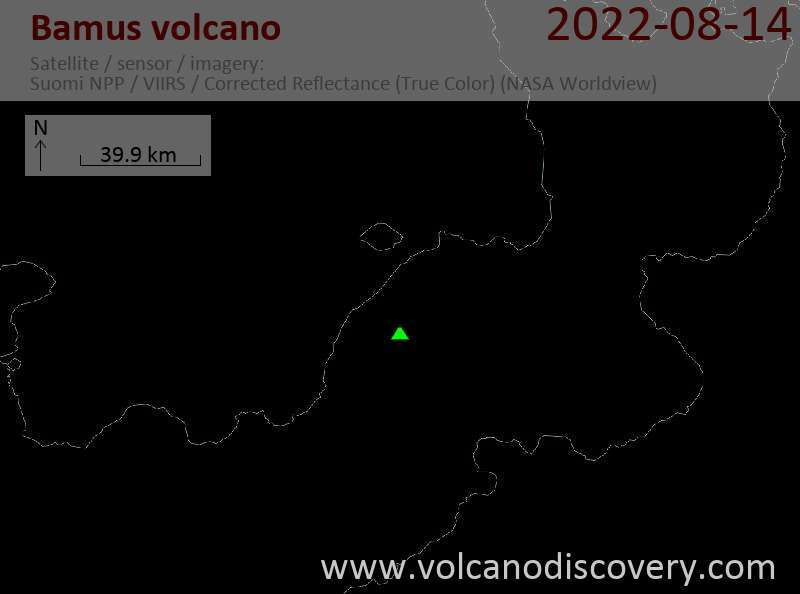 Bam volcano belongs to the Bismarck volcanic arc north of New Guinea. Bam is the SE-most of the Schouten Islands and ocated 40 km NNE of the mouth of the Sepik River. Bam volcano contains 2 peaks, the NW peak being the active summit, and the SE peak an older cone and slightly lower. The oval 300 m diameter and 180 m deep summit crater of Bam is free of vegetation due to frequent and recent volcanic activity. The crater has steep walls with exposed lava flows dipping inwards. The historic eruptions, recorded since 1872, were small to moderate vulcanian eruptions from the summit crater. Hot springs are found on the island. A NE-trending landslide scarp extends across the upper part of the andesitic volcano from the SW coast, and a large submarine debris-avalanche deposits lies to the south and SW. The younger summit cone partially buries the eastern side of the collapse scarp. A recent lava platform on the north flank supports the small island's only villages. 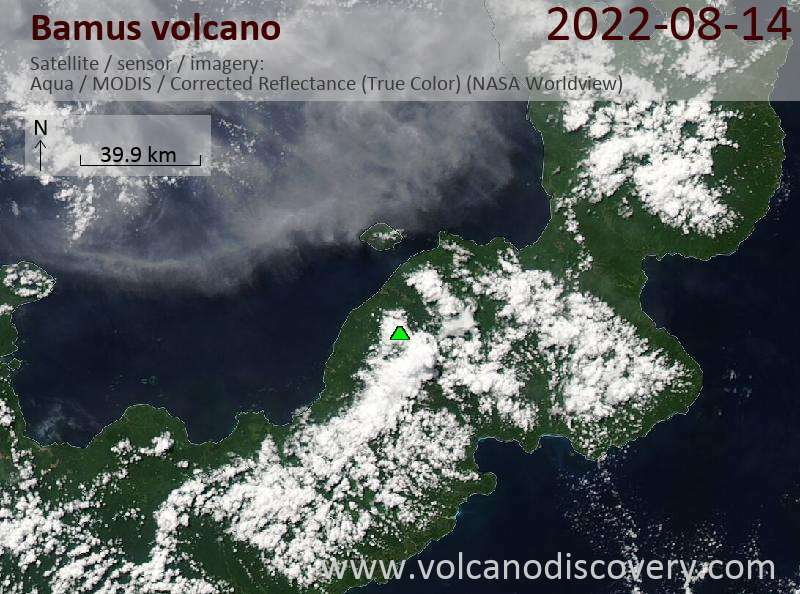 According to John Seach, "islanders note a seasonal pattern of eruptions, with ash emissions occurring in the doldrums" (http://www.volcanolive.com/bam.html), but no source of this information is given. A very strong shallow magnitude 6.8 earthquake occurred 6 km from Bam (Biem) volcano close to the coast of Papua New Guinea on Monday 1 August 2011. A tsunami warning was issued and later cancelled. The island has a population of approx. 2,000 indigenous people, most of which live in wooden houses built on stilts. According to Earthquake report.com, no major damage occurred fortunately. Small explosive eruptions occurred from the central crater. Explosions from the summit crater caused damage to farmland. According to volcanolive.com (no source given), explosive eruptions produced ash columns reaching over 2500 m.
A larger explosive (probably vulcanian) eruption (VEI3) occurred on 13 November 1877. The first recorded eruption of Bam occurred around 1872. Large amounts of ash were ejected from the summit crater. There was damage to property and people were evacuated.